When the UK supreme court opened for business just over a year ago one of its most exciting innovations was that, for the first time in the UK, hearings would be filmed and recordings made available to broadcasters. The change followed 20 years of campaigning and preparation, and was heralded as a turning point in the history of our legal system. This is a great shame, and in my view represents a failure of imagination on the part of broadcasters and the court, rather than a lack of interesting material. Why the cold shoulder from broadcasters? The usual explanation is that supreme court hearings are too boring. Unlike the Crown Court, where high-profile criminal cases are heard – along with exciting cross examinations and grandstanding barristers – the supreme court is a court of appeal, which means that cases usually involve technical legal argument, using conceptual language and presented in a rather spare advocacy style. There are no witnesses and, as Baroness Hale said, “no drama”. Admittedly, some cases which come before the supreme court can seem a bit dry, and whilst they may be of great importance and interest to the litigants and lawyers, are unlikely to capture the public interest. But many would. To pick just a few from the court’s first year, the Jewish Free School case went to the heart of what it is to be a Jew, the R (Smith) case decided that the human rights act did not apply on an Iraqi battlefield and the Radmacher judgment gave new prominence in English law to pre-nuptial agreements. The argument that the advocacy style is too boring is defeatist. Whilst some legal arguments are often technical and difficult, this can be remedied by good editing and commentary. Anyone who listens to the Today program or watches Newsnight will see the same issues being debated every day in an entertaining style. And some Queen’s Counsel are fantastic speakers whose arguments would make for good TV given the right editor. Things may slowly be changing. 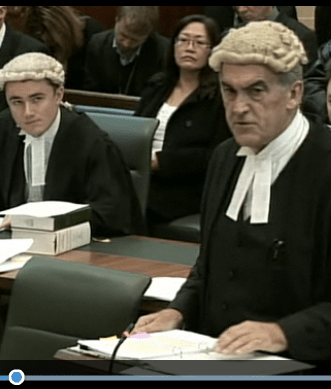 The court’s judgment in Radmacher (the pre-nup case) was broadcast on the BBC News website, and part of the opening argument in the expenses scandal parliamentary privilege appeal is also available online. But these represent the exception, not the rule. This could be remedied fairly easily. All of the hearings are already being digitally recorded at great expense; why not make the raw footage more widely available via the court’s website or Youtube, if not live then shortly after the hearings? It is unlikely that the general public would trawl through hours of argument to find the interesting parts, but given the proliferation of well-informed legal bloggers, the indexing and editing of hearings could be ‘crowdsourced’. In other words, there are plenty of people with enough technological and legal savvy to find innovative ways to present the footage, if it was made more widely available. This is effectively what has happened with court judgments since they have been made freely available via the Bailii website. There would be many benefits to this approach. With legal aid disappearing due to budget cuts, people who are forced to represent themselves would have a greater insight into the UK courts. Law students could be given master-classes on advocacy without having to enter a court room. The great advocates of today could be recorded for posterity. Most importantly, the justice system would be more transparent and accessible, which was the point of the reforms in the first place. Ultimately, justice will only be seen to be done in the true sense if more courts are opened to TV cameras, not just the supreme court. But until that time, our highest court could be doing more to put the nation’s QC on our TV. Unfortunately the link to the on-line opening speech in the MPs expenses case posted above doesn’t seem to be working (perhaps the video is no-longer available on that website). Do you know where else I may find it? I’m in FULL agreement with your article – As a Bar student, being able to access this level of advocacy either on-line or via the TV would be an invaluable learning tool – it is after all what we are all aspiring towards! We have BBC Parliament. Why not BBC Supreme Court or BBC Justice (or whatever you want to call it)? And when the court is not in session, there could be documentaries exploring historical cases, explaining how the law works, interviews of lawyers, judges etc, or even panel discussions of various legal issues affecting Britain today. For instance, if an asylum case was making the news, they could discuss asylum law. Or right now they could be discussing whistleblowing, leaks, diplomacy and official secrets since Wikileaks is making headlines again. This is, after all, what the BBC is supposed to be for. However, I’m not sure about allowing cameras into criminal trials – what about people’s privacy?